NuScale Power, LLC (NuScale) and Concurrent Technologies Corporation (CTC) have announced the signing of the initial contract for the new Center for Advanced Nuclear Manufacturing (CANM), operated by CTC. The contract covers prototype work for manufacturing NuScale’s helical coil steam generators, a major component in the NuScale design, now under certification review by the U.S. Nuclear Regulatory Commission. The significance of the announcement is that in 2015 NuScale successfully tested a full scale helical coil steam generator (HCSG) at the SIET S.p.A (SIET) facilities in Piacenza, Italy. The NuScale design includes a first-of-a-kind HCSG for conversion of nuclear heat into process steam. Testing of the full-length HCSG was conducted at prototypic fluid temperatures, pressures and flow rates to measure the steam generator’s thermal performance. The data is being used to validate NuScale’s computer codes and to help NuScale vendors optimize the performance of their steam turbines for a NuScale application. Flow induced vibration testing was performed as part of the assessment. These tests provided important input to the NuScale Design Certification Application to the NRC in 2016. At the Winter Meeting of the American Nuclear Society, a spokesman for the firm said it plans to break ground in Idaho in 2023 for its first customer, UAMPS, at a site on the grounds of the Idaho National Laboratory. NuScale contracted the services of SIET for the full-scale testing of the HCSG performance over the expected range of reactor operating conditions. SIET has extensive experience with similar heat exchanger test bundle fabrication and testing for other reactor vendors. “We have been making great progress with the network of companies and facilities that will be needed to manufacture the NuScale Power ModuleTM,” said Dale Atkinson, chief operating officer and chief nuclear officer for NuScale. CTC is an independent, nonprofit, applied scientific research and development professional services organization. Since its inception in 1987, CTC has gained extensive expertise in operating national centers of excellence. The company has a proven track record of solving first-of-a-kind manufacturing issues and successfully transitioning solutions to end-users. CANM will leverage a significant investment by the U.S. Government in CTC’s facilities, equipment, personnel and a network of manufacturing technology specialists. “Small Modular Reactors (SMRs) and other Advanced Reactors (ARs) are extremely promising next-generation electricity sources for this nation, and NuScale is blazing the trail,” said Ed Sheehan, Jr., president and chief executive officer of CTC. Terrestrial Energy, a developer of an advanced reactor design, has received notice from the Canadian Nuclear Safety Commission (CNSC) that it has successfully completed the first phase of the CNSC’s pre-licensing vendor design review for its Integral Molten Salt Reactor (IMSR) nuclear power plant design. Terrestrial Energy was the first advanced reactor vendor to enter the regulatory process in Canada, and now the first to have its design assessed. The firm hopes to deploy its first commercial unit within the next decade. According to the Canadian Nuclear Safety Commission, a Pre-Licensing Vendor Design Review is an optional service provided by the CNSC when requested by a vendor. A pre-licensing vendor design review is an assessment of a nuclear power plant design based on a vendor’s reactor technology. The words “pre-licensing” signifies that a design review is undertaken prior to the submission of a licence application to the CNSC by an applicant seeking to build and operate a new nuclear power plant. The CNSC’s vendor design review verifies that the reactor’s design meets the basic requirements for a nuclear power plant in Canada but does not certify or license the reactor. Commercializing an advanced reactor power plant design such as the IMSR involves a range of activities that must be undertaken at an early stage to support deployment. These include regulatory and industrial engagement, site selection, and government support. Terrestrial Energy is studying the feasibility of a number of sites in North America, including Canadian Nuclear Laboratories at Chalk River, Ontario, as well as the Idaho National Laboratory in the U.S., for building its first commercial power plant. The IMSR power plant design is the first and only advanced reactor power plant project to enter the invitation-only stage of the U.S. Department of Energy’s loan guarantee program for construction financing support, with Idaho National Laboratory under consideration as a lead site. “International energy agencies recognize that intermittent renewables such as wind and solar alone cannot meet all the demands of a global clean energy system and agree that nuclear energy will play a critical role in meeting our future energy needs. Advanced reactors offer a new and transformative set of nuclear technologies that are zero-emission, have far greater industrial application, and make nuclear power plants more economical and easier to finance” Irish said. 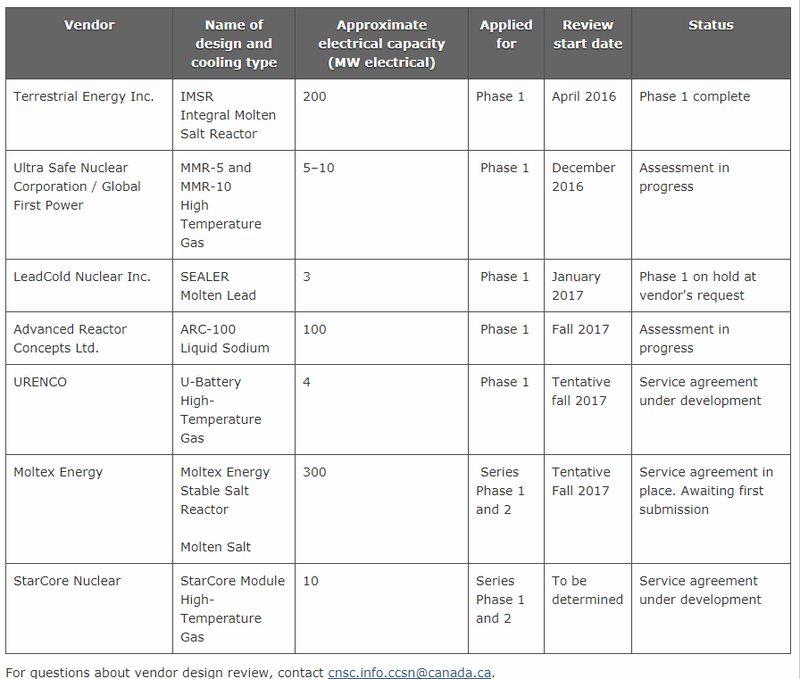 The following table presents an overview of vendors who have applied for pre-licensing engagement with the CNSC using the vendor design review process for their new reactor designs. Vendor design review is described in CNSC guidance document GD-385, Pre-licensing Review of a Vendor’s Reactor Design. Executive summaries, which do not include proprietary details, are available on the CNSC website for review. Jordan is conducting a feasibility study to establish of two Small Modular Reactors (SMRs) in Jordan for the production of electricity and water desalination, Vice Chairman of Jordan Atomic Energy Commission (JAEC), Kamal Araj in revealed on 11/14/17. Araj’s remarks came during his participation in the annual meeting of the International Framework for Nuclear Energy Cooperation (IFNEC) held in Paris last week. In his speech at the meeting, the JAEC commissioner said that building the SMRs comes in partnership with the King Abdullah City for Atomic and Renewable Energy (KACARE) and the Korea Atomic Energy Research Institute (KAERI). This step comes as part of the JAEC plans to diversify of reactor design options which include for example, compact micro-reactors, studies on spent nuclear fuel and nuclear fuel disposal methods, Araj told Petra’s reporter. The commissioner stressed the importance of by engaging local industries by at least 20 percent in the construction of upcoming Jordan’s nuclear reactor in line with competitiveness criteria in terms of price and quality. On the sidelines of the meeting, Araj signed a memorandum of understanding with the British “Rolls- Royce” company to conduct a joint feasibility study to build a reactor designed by a special coalition led by the company. According to WNN in September 2014 Jordan’s JAEC signed a project development agreement with Rusatom Overseas for two 1000 MW VVERs. Two yeasrs later in 2016 Rosatom said the target date for operation of the first unit is 2023, with the second one 2024-25. The two will contribute 48% of Jordan’s electricity and enable exports to Syria and Iraq. Financing for the twin VVERs remains uncertain with Rosatom taking a 51% share of the costs. So far Jordan has not been able to obtain commitments from other equity investors for the project which is expected to cost $8-10 billion for the two reactors. At one time Jordan offered to provide access to uranium deposits in the n the Hasa-Qatrana area as a means of financing the effort. However, both Areva and Rio Tinto, after prospecting the area, declined to enter into development efforts.